09 May 2017 / 12:09 H.
THE term "peri-urbanisation" is not popularly used in Malaysia. But it does not mean that it is not an important topic since it refers to what has been happening at the fringes of towns and cities. The expression originates from a French word to describe spaces between the city and the countryside. Many of these areas have become more urban in character in terms of physical, social and economic changes. Even to casual observers, the fringes of the towns and cities in Malaysia are populated and well-used. For example, in Penang Island, there are more and more built-up areas comprising residential houses, high-rise apartments, department stores and even hotels outside the boundaries of George Town. In fact, it is not possible for visitors to distinguish between development in the city centre and its peri-urban areas. There are no clear distinctions of rural and urban as the regions overlap. According to an article entitled "Urban Sprawl in Malaysia: Evidence From Three Largest Metropolitan Areas" in the Journal of the Malaysian Institute of Planners (2009) VII, 69-82, written by some lecturers of Universiti Teknologi Mara Malaysia, urban sprawl is obvious in Kuala Lumpur, Penang and Johor Baru, the three largest metropolitan areas in Malaysia. According to the academicians, George Town had a population decline. In other words, its net out-migration figure has been higher than the population increase. Rapid urbanisation has resulted in people moving to peri-urban areas rather than remaining in the city. New townships like Bayan Baru were built to cater to the housing needs of factory employees. As a result, the surrounding towns, namely Sungai Ara and Relau have also undergone massive development. More roads have been built to accommodate the use of cars as a means of transport. More importantly, public transport should have been improved. Bagan Jermal, Pulau Tikus and Jelutong have been urbanised. The urban fringes of Penang Island include Air Itam in the west, Tanjung Tokong and Tanjung Bungah in the north and Glugor in the south. These areas have been classified as the Greater George Town area. In fact, there is continuous development along the southern part of the island all the way to Bayan Lepas, Batu Maung, and even Teluk Kumbar and Balik Pulau. New houses especially high-rise buildings are sprouting up. 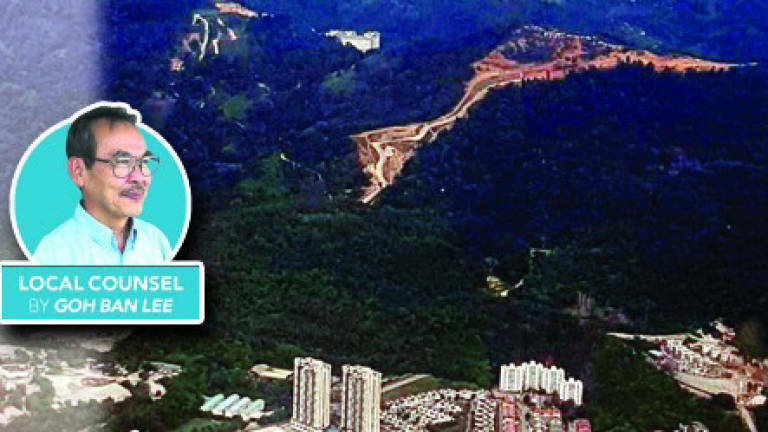 The main cause being these areas are near the Bayan Lepas Free Trade Zone, where the multinational corporations are located. This industrial transformation was the brainchild of the late second chief minister of Penang, Tun Dr Lim Chong Eu, who served from 1969 to 1990, to overcome the high unemployment rate Penang suffered in the 1960s. The Penang Development Corporation founded in 1969 was tasked with spearheading the social economic growth, thereby creating job opportunities and improving the quality of life of the people. Changing economic structure from agriculture to manufacturing, starting from the 1970s has resulted in the growth of Bayan Lepas on Penang Island, Kulim (1980s) and Batu Kawan in the mainland. The increasing movement of people from the city to peri-urban areas are routine happenings. What is important is for government officers in charge of urban planning to look after these areas well and ensure that there are adequate shelters that are built with permission. The town planners should also ensure that there are adequate schools, markets, shops, clinics and other facilities for a reasonably good living. Land outside the city boundaries has been neglected by municipal officers. As a result, illegal stalls and houses have been built. After some time, the illegal stalls and houses become eyesores due to poor maintenance and lack of enforcement of the law. It takes considerable effort to demolish illegal buildings, including hawker stalls and houses. The occupants or owners of the illegal buildings usually fight hard to retain them. Making things worse, there are politicians who interfere in the workings of the local government officers to demonstrate that they are hardworking and are sympathetic to the poorer segment of society, including petty traders. It is essential to remind the town planners, technical officers and the politicians to pay adequate attention to peri-urban areas. More importantly, they must ensure that the laws are enforced.